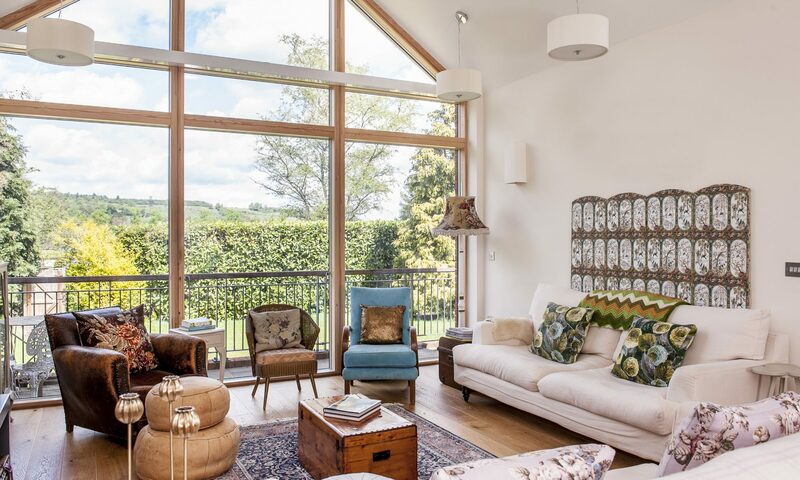 When Jenny and Doug Branson decided to make a move to Dorking they initially set their sights on Victorian properties. But for interior designer Jenny, a chance viewing of a new build property proved to be an irresistibly blank canvas. 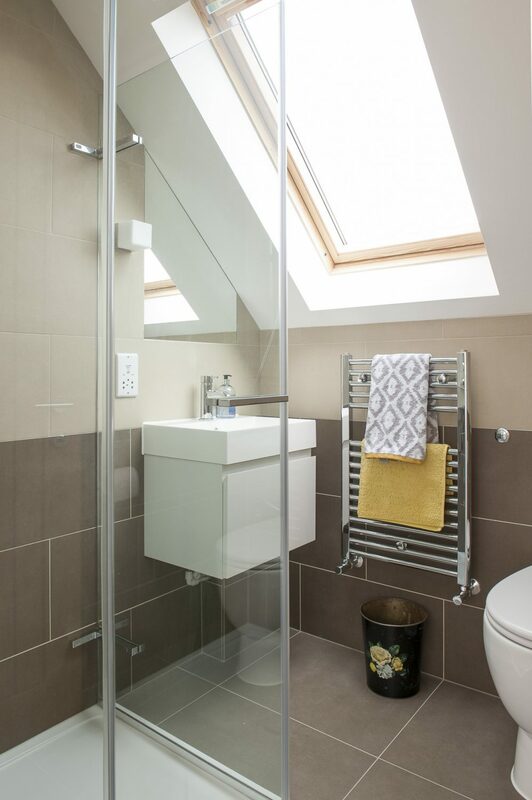 The imaginatively designed new-build is on the rise and more and more couples and families are being attracted by not only the value for money they can represent but the sheer quality of life they offer their owners. 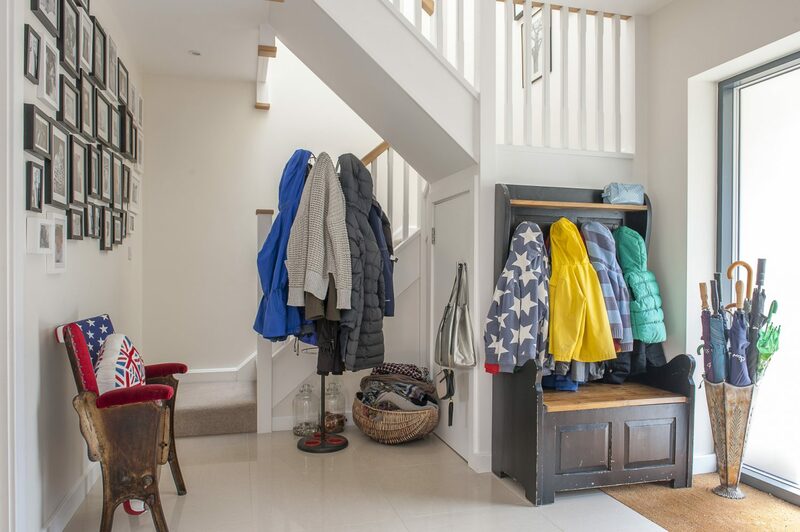 And such a couple were Jenny and Doug Branson when they were looking for a new home for themselves, son Jasper (7) and twins Kit and Jude (5). Actually, that’s a lie. 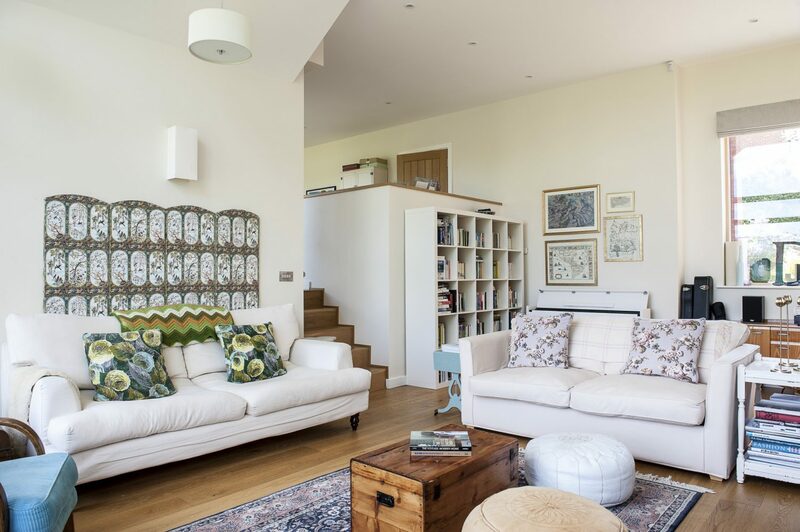 Like so many other house-seekers they were looking for a period home – in their case a Victorian house like their previous terraced home but larger. However, the sums didn’t quite add up and they became open to a more contemporary property. 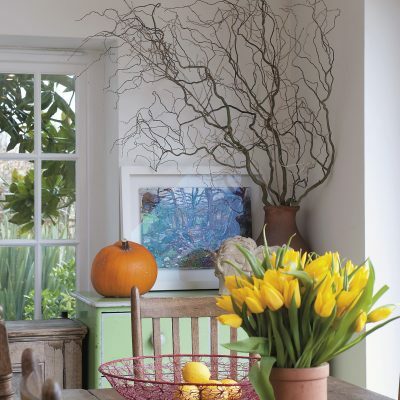 When the couple saw the house, in Dorking, it was empty – a big white blank canvas and, to Jenny, irresistible; she had trained as an interior designer and worked for interiors magazines before becoming a freelance stylist offering whole home or room by room advice, often becoming involved with properties for sale. She has now also started a vintage toy business which has rapidly expanded into all things vintage and has both a website – www.teacosyhome.com – and a concession in Dorking High Street tea shop Gorgeous Gerties. This was a totally different environment from her Victorian house and needed a certain approach not only in terms of décor but furniture. 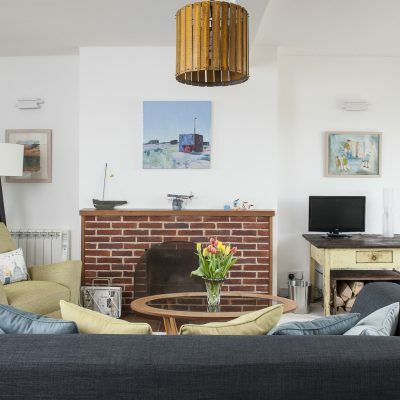 Jenny’s knowledge of 60s vintage and Scandinavian furniture – and where to source it at the right price – had always been part of the service she had offered to her clients and it now really came into its own in her own home. A combination of the two styles, seasoned with a pinch of Ikea, was the perfect solution. However, there is always the danger with a favourite style of allowing one’s passion to get the upper hand and for a property to become a museum, a hymn to a particular genre, and while fascinating for a connoisseur to explore, not always a success as a family home. Jenny’s training and experience has allowed her neatly to sidestep this particular pitfall and although there are certainly pieces that demand one’s attention and appreciation, they know their place and that place is to delight rather than dominate and to contribute to the action of the home rather than be the attraction. 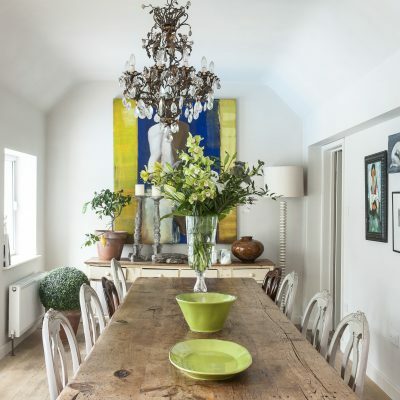 The heart of the property is the dramatic downstairs space which encompasses a kitchen, dining room, and down a few steps, a stunning living room. Off the kitchen is the only other downstairs room, the children’s playroom. 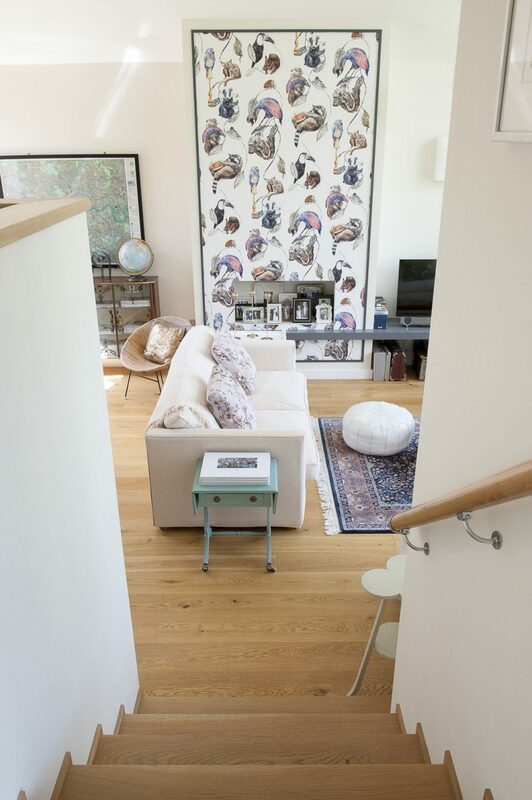 Twin key to the success of all these spaces is the light which pours in through floor to ceiling glass walls which run the full length of the rear of the house – and Jenny’s light touch. 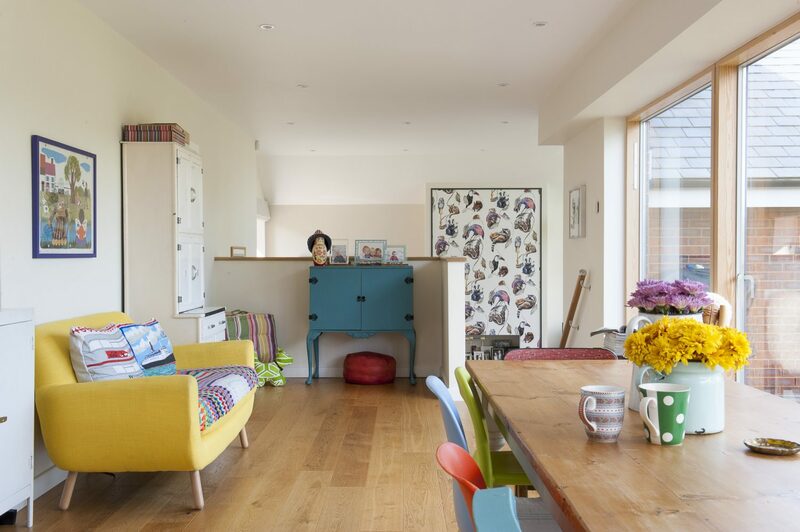 The kitchen has no blinds or curtains across its glass wall, just an uninterrupted view out to the surrounding decking terrace and the local countryside. In attendance at the breakfast bar are some 1960s school chemistry Bend stools. 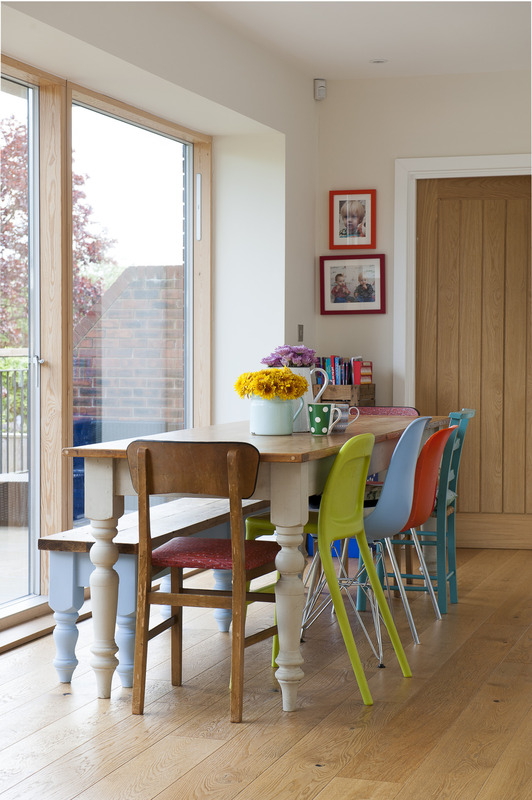 On one side of the pine dining table gather a collection of plastic and metal 1950s/60s chairs with the odd Ikea replica interloper while on the other is a bench from the Old Table Company. 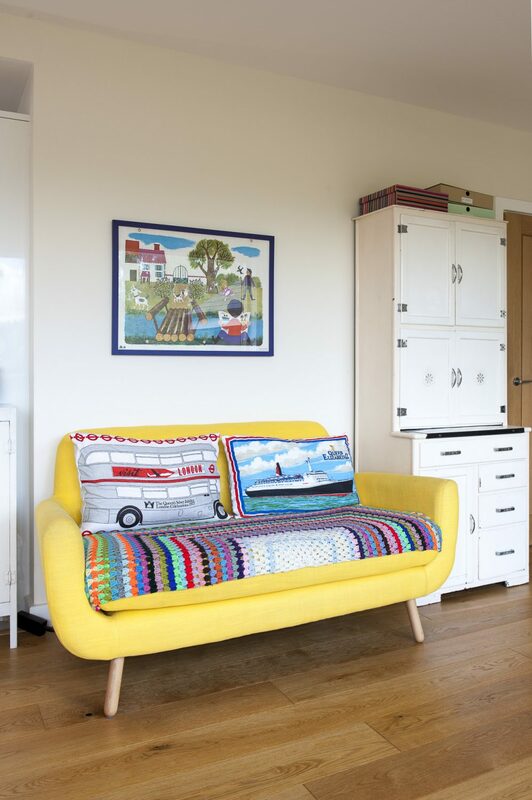 The pretty 60s-style sofa is from Made.com and above it hangs a 1960s French schoolroom poster. Opposite is a vintage Swedish brown leather chair from eBay. Down a few steps and one is in a vaulted drawing room with its glass wall soaring to the apex of the roof. 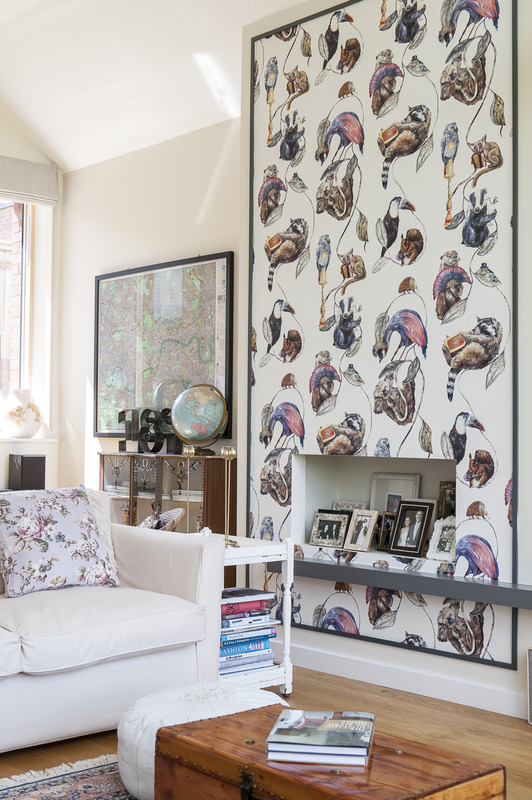 The second thing that demands one’s attention is the stunning chimney breast papered entirely in House of Hackney ‘Empire’ featuring a variety of critters enjoying themselves, among them a hookah-smoking sloth, a frog in a bowler hat, a fanning otter and an imbibing badger. A glass fronted cabinet from a car boot sale, topped with a US tin tile, houses Jenny’s glass collection. 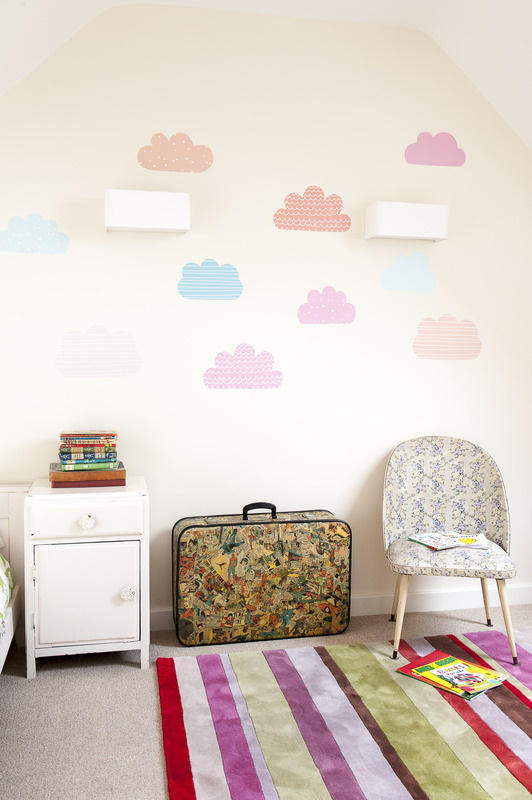 “There is lots going on in this room but the colours tie it all together,” says Jenny. 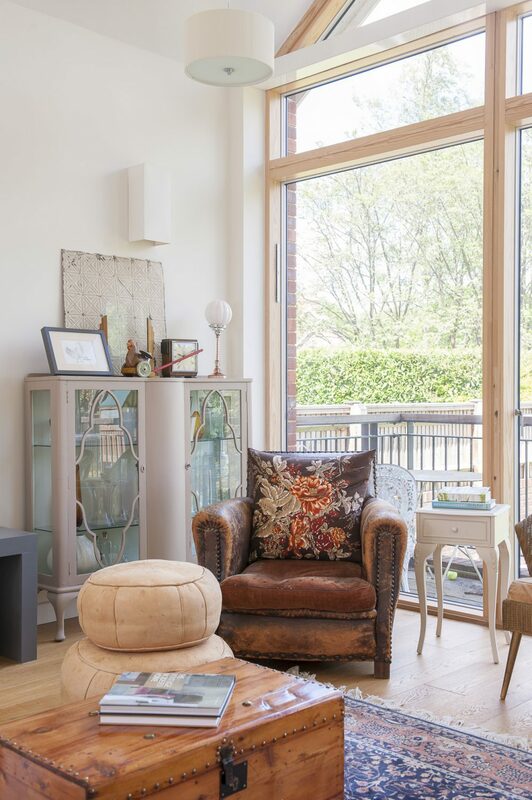 By the window is a collection of period armchairs, one of which once belonged to Doug’s grandmother and which the couple have had re-upholstered in a very 60s turquoise. 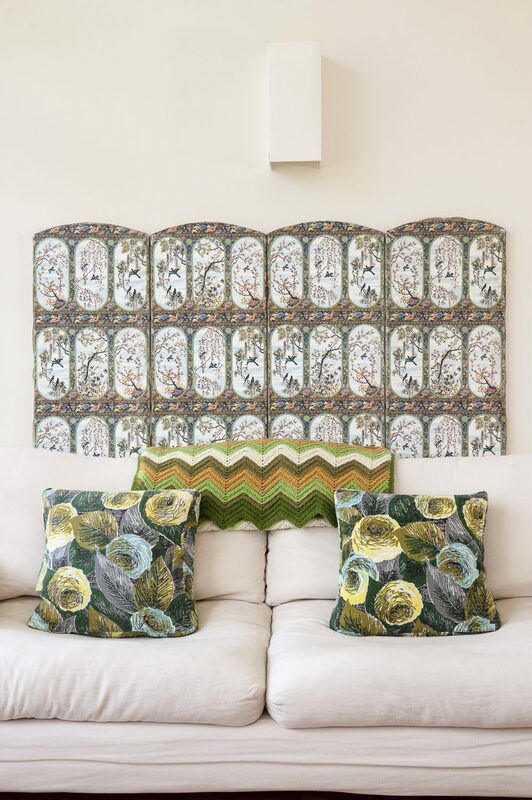 On the wall behind one sofa is a vintage French screen and on both sofas are cushions made by Jenny from bark cloth and old 1960s silk scarves. In a corner stands a truly lovely 1960s blond wood console kept company by an Ikea bookcase, electric piano and an unusual double Lloyd Loom piano stool. 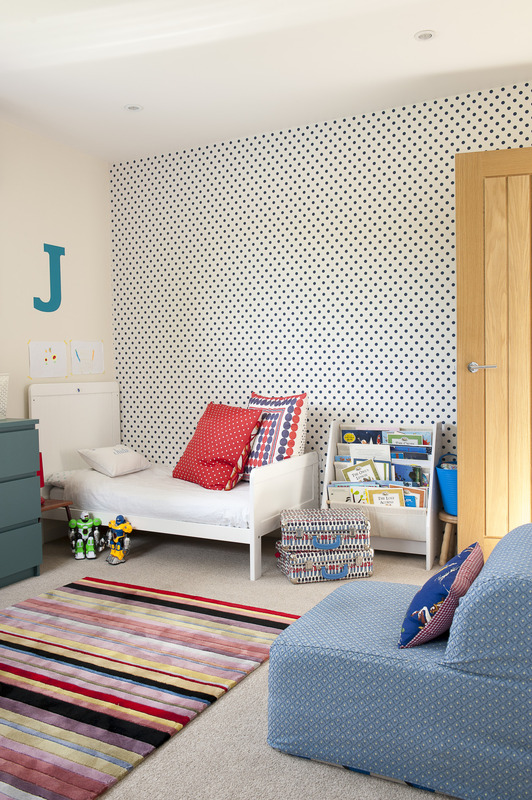 In the downstairs hallway is a cinema chair upholstered in Stars & Stripes – homage to Doug’s US heritage – and a lovely rogue’s gallery of black and white framed family photographs. On the upstairs landing are a number of great black and white prints picked up by the couple on their travels in South Africa and the US. 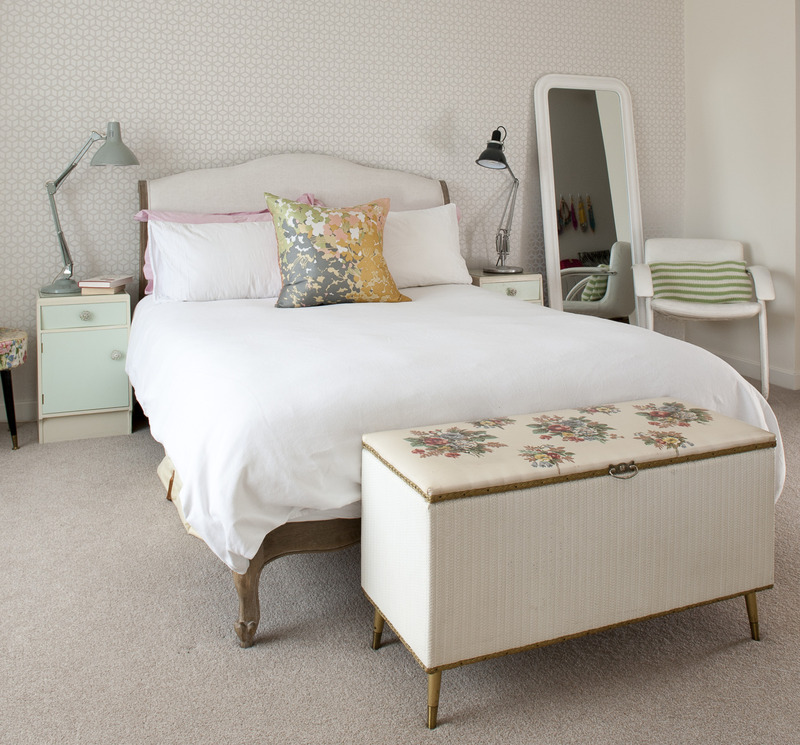 The master bedroom is all delicate whites and pastels and light as a feather. The trellis wallpaper is by Harlequin and the curtains Osborne & Little. The only thing that anchors the room to the earth is a chunky pale blue Victorian chest of drawers. Each side of the Loaf bed are matching 60s cabinets on which stand two Anglepoises – one 60s and the other contemporary. 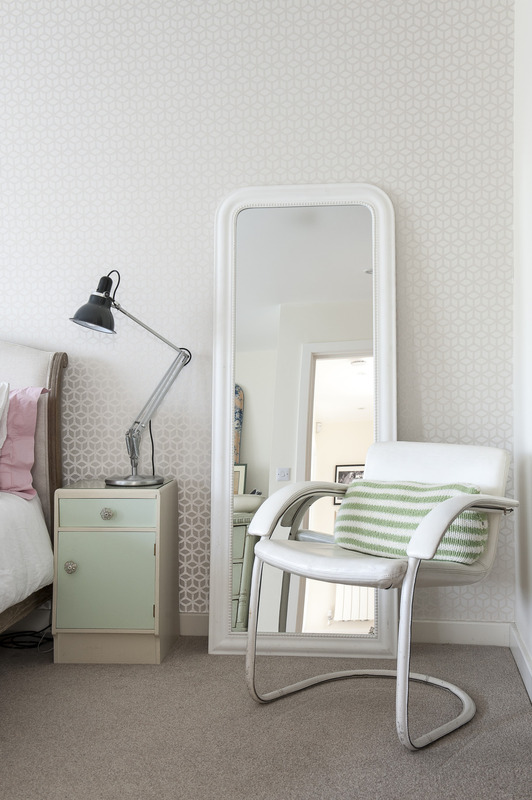 Beside the bed stands a truly great find – an elegant, 60s steel-framed, white leather chair and by the window a tailor’s dummy, a trophy from a bygone photo shoot. In Jasper’s room, the colours are considerably stronger. Jenny has taken an Ikea pine bed and, with the help of Annie Sloane, turned it lime green to match the 60s ball chair. 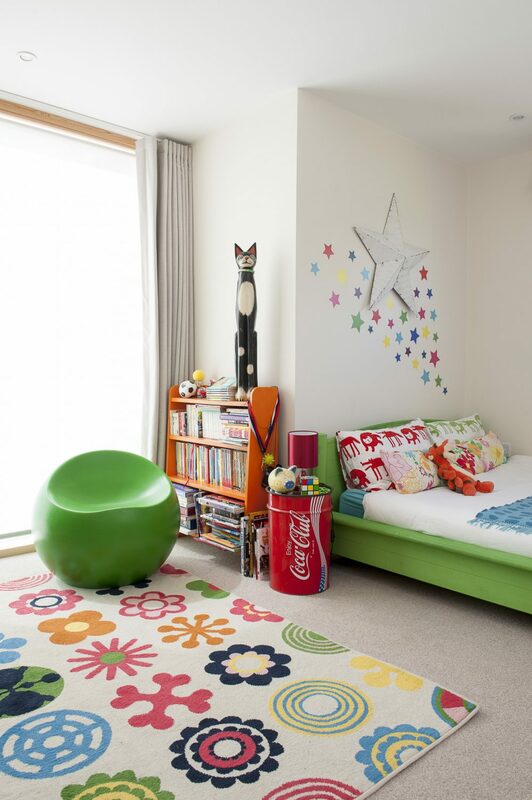 Beside the bed is a Coca-Cola drum table and above it a crowd of multi-coloured stars. 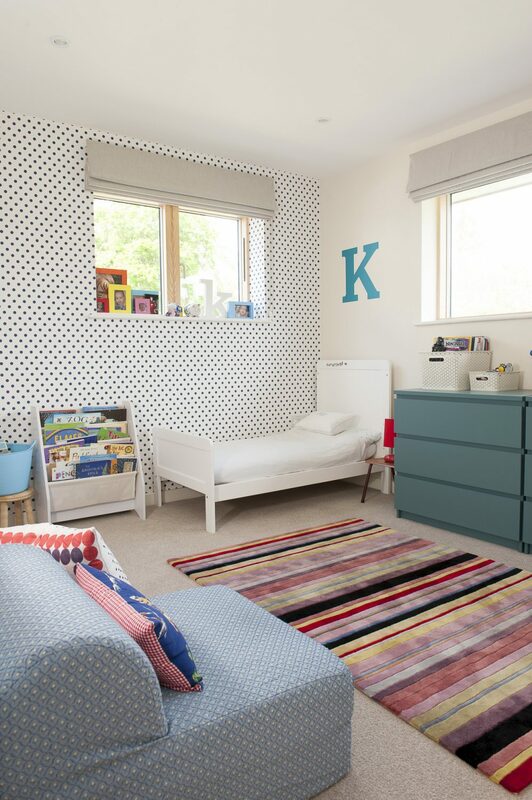 In the twins’ room, John Lewis beds are topped with their initials, presumably to head off bedtime squabbles at the pass, and matching Ikea chests of drawers. The guest room is a very pleasing vaulted space at the top of the house with, again, one wall completely glass. Jenny has appropriated a place by this window and its view as her office and installed a Victorian pine table with painted legs and a bent-wood chair. 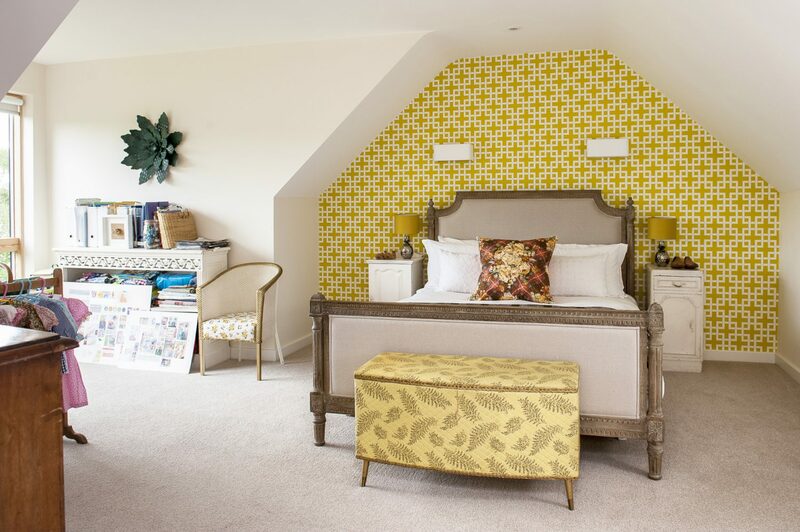 The wall over the Loaf bed is papered in Clarke & Clarke ‘Lattice’ and against another wall stands an unusual gilt Lloyd Loom chair and next to it a handsome, Victorian bow-fronted oak chest of drawers. Not only is Jenny’s house a great example of imaginative and thoughtful contemporary architecture but it has had the good fortune to fall into the hands of someone who really understood how to do it justice while at the same time creating an enjoyable and often inspiring environment in which her family could live and grow. The two elements have come together to prove once again that although the past has much to admire and enjoy, so, too, can the future.